Bedazzle your next costume or party attire with this stunning temporary tattoo kit. Get the exotic henna look without all the mess, with glitter and beads that add extra bling. A great accent for any style of belly dance, Bollywood, weddings, or any costume / outfit that you want to dress up! Bedazzle your next costume or party attire with this stunning gold stick-on temporary tattoo kit. 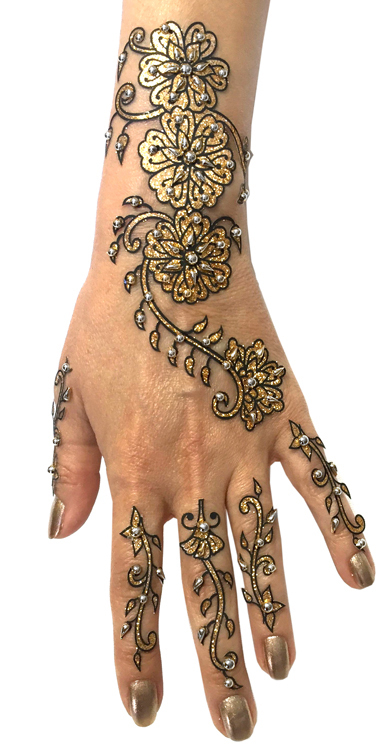 Get the exotic henna look without all the mess, with glitter and beads that add extra bling. A great accent for any style of belly dance or Bollywood costume, or any costume / outfit that you want to dress up. Also works well for Halloween, Mardi-Gras, Carnivale, weddings, bridal showers, and more! Comes with one large decal and five smaller pieces. Apply to your hands, feet, arms, or any place you choose. Adhesive backing makes it easy to to apply, and reusable with any eyelash or body glue. Please note that this item may not be returned after purchase. I purchased this to wear at my Hindu wedding. Traditional henna was not an option because I was also having an American wedding two days later and did not want the permanence of henna. I was hesitant to order this, but it actually looked much better in person and I received many compliments. It had just the right amount of bling. If you are wearing bangles with this, definitely put the bangles on BEFORE the tattoos (wish I had realized that), otherwise the tattoos will start to peel off and some of the little beads will fall off. These stay on quite well, I am impressed! They look amazing!